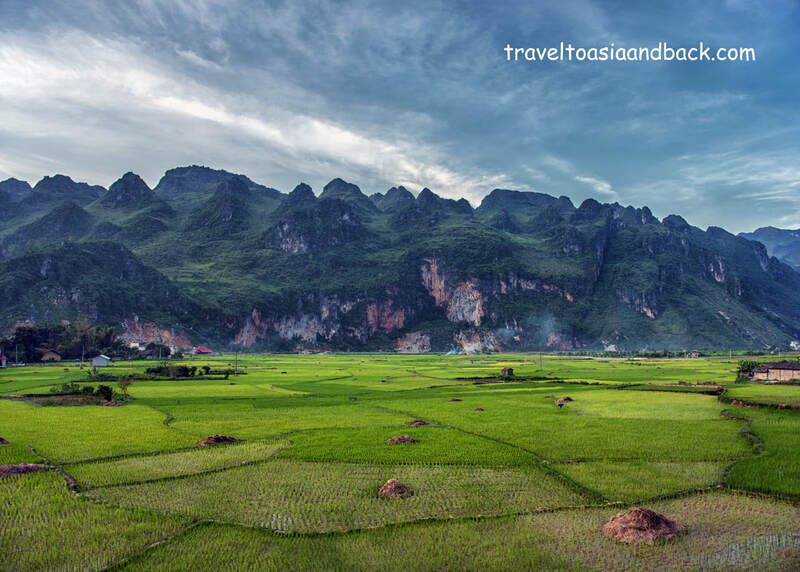 Sharing a border with both China and Lao Cai, Ha Giang province is well known for its spectacular scenery; a dramatic mixture of high mountains, rocky cliffs, deep valleys, rivers, rice terraces and limestone hills. The northernmost districts of the province, Quan Bạ, Yen Minh, Dong Van and Meo Vac, are considered to be among the most remote areas in Vietnam. The Dong Van Karst Plateau Geopark, a UNESCO World Heritage site covers over 900 square miles (2,356km²) of these four districts. 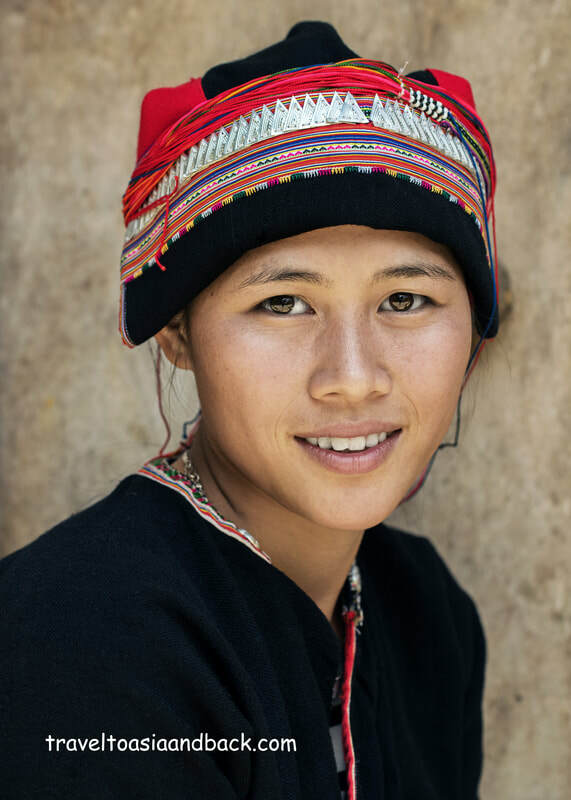 The province is home to over 20 different groups of ethnic minority people including the White Hmong, Tay and Dao. These subsistence farmers are some of the country’s poorest people as much of the land is steep and rocky and is not suitable for farming. Few tourists venture to this part of Vietnam, in part, because of a general lack of tourism infrastructure. Every major town along the highway has plenty of hotels and motels; finding a bed to sleep on is not a problem. However, hotels in the region will be two stars at best. There are no souvenir shops or foot massage joints, restaurants cater to locals and virtually no one speaks more that a few words of English. At the same time, all the factors that repel tourists attract travelers, particularly motorcycle enthusiasts. The capital of Ha Giang province, Ha Giang City lies 176 miles (284 km) north of Hanoi and can only be reached by road. From Ha Giang City travelers will continue their journey by motorcycle, hire car or bus in a northeasterly direction on highway QL4C towards Dong Van, eventually arriving in the market town of Meo Vac. From Meo Vac some travelers will head south on highway Ql34 to complete what’s known as the “Ha Giang Loop”. This 200-mile (320 km) circular tour of Vietnam’s extreme northern frontier can be completed in as little as two or three days, but three to five days will allow visitors to explore the area at a more leisurely pace. Travelers who do not wish to tour the area by motorcycle can hire cars with drivers, as it is not possible to simply rent a car in Vietnam. There are many travel agents in Hanoi that can organize hire cars; rates are generally per diem and may or may not include food and lodging for the driver. Its best to shop around a bit before committing to a particular agency as prices do vary, but generally speaking a hire car and driver will cost from $40-$50 USD per day. It is possible to tour the province by bus, taxi or a combination of both; however it requires a degree of flexibility and patience. Local buses serve as a vital link between key towns, transporting not only passengers but cargo as well. Buses are the UPS of northern Vietnam, transporting boxes of food, household goods and building materials. Locals organize transportation, for either themselves or their packages by calling bus companies and arranging a pick up time. Travelers wishing to utilize buses in the region are best off having a local call ahead and confirm a pick up time and location. 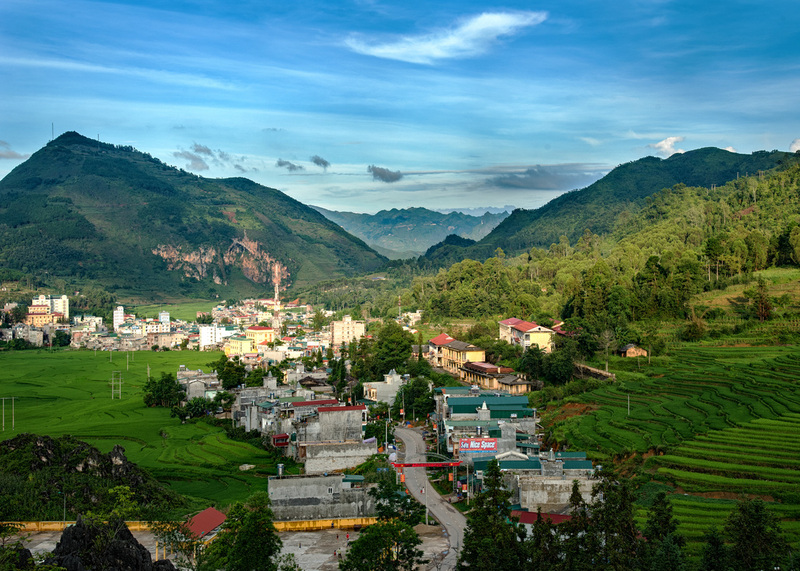 Ha Giang City is the gateway to Vietnam’s northern frontier and will be the first stop for most travelers on their journey through the province. It takes six and a half hours to reach the city from Hanoi on Highway QL2, a sealed modern road. Hung Than Travel operates both morning and afternoon buses to Ha Giang from Hanoi ’s My Dinh bus station (Bến xe Mỹ Đình) for 200,000 VND. Many travelers start their motorcycle adventures from here, renting bikes from one of the city’s many agencies, and returning it at the completion of the loop. Local buses and taxis are available to continue the journey up the northern side of the loop towards Dong Van and Meo Vac. It should be noted that to travel to and around the northern frontier a travel permit is required. Issued at the police station / immigration office, it is valid for 10 days and costs 210,000 VND, just under $10 USD. Most hotels in the northernmost parts of the province will ask to see the permit and may refuse lodging to visitors without one. Although it rarely occurs, it is possible that a police officer may ask to see the permit. The Bông Hostel and Cafe, one of the few place in the city that caters to travelers, will save visitors a trip to the police station and organize a permit for a fee of 20,000 VND. The permit can also be obtained through hotels in Dong Van as well. 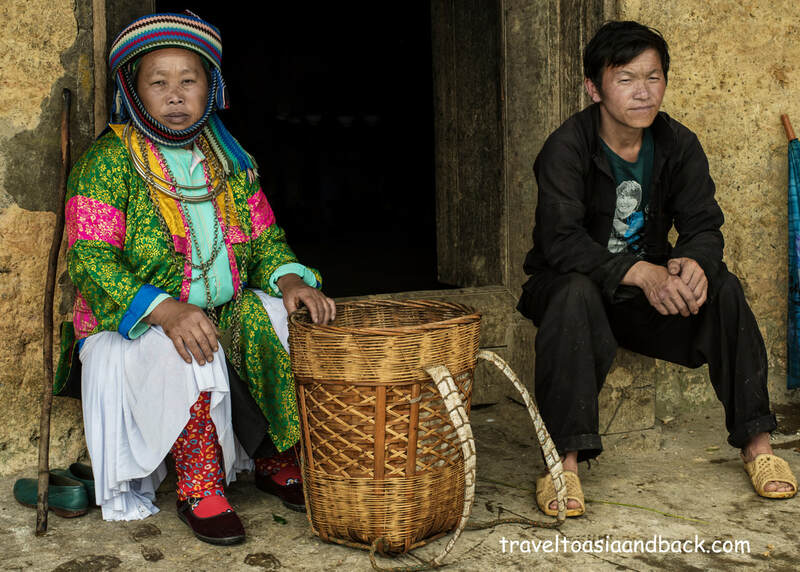 Although most travelers only pass through Ha Giang City on their way to the frontier, the area does offer some trekking opportunities and home stays in several traditional Vietnamese farming villages. Located approximately 4 miles (6 km) west of the city center, the village of Thon Tha in Phương Độ commune is especially popular with travelers looking to experience the peace and tranquility of village life. Traveling north on QL4C (Highway 4), on the clockwise loop from Ha Giang City, Tam Son, the capital of Quan Ba district, will be the first large town that travelers reach. Roughly 31 miles (50 km) from Ha Giang City, a two-hour drive up winding mountain roads few visitors stop here for more than one night. Although it is a very small town, Tam Sơn has a number of hotels, restaurants and sites to see. Here, the most well known “attraction” is a pair of limestone mounds or hills known as Núi Đôi Cô Tiên or Fairy Bosom Mountain. To get a beautiful photograph of these hills with the bright green rice terraces in the foreground, make a visit to the hilltop observation point on Highway 4, approximately 1.25 miles (2 km) south of the town center. Tam Son also hosts a fairly large market every Sunday morning. The market attracts ethnic minorities from Quan Ba district and beyond. It is considered to be one of the biggest markets in the province and is often included on tours. Located 3 miles (5 km) from Tam Son is the sleepy village of Nam Dam (Nặm Đăm). Inhabited by extremely friendly people from the Red Dao ethnic group, this tiny farming village is a fantastic place to do some self- guided trekking and enjoy the tranquility of the countryside. 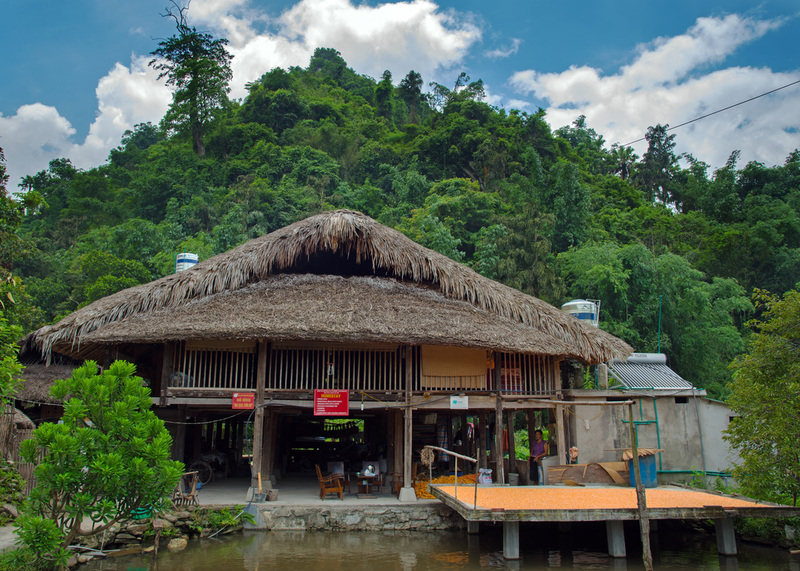 Although Nam Dam has a community based tourism program and a number of simple home stays, there is nothing else here besides simple, traditional homes. This off the beaten path destination provides an excellent way to experience rural northern Vietnam at its best. Photographers will find this destination particularly appealing during rice planting and harvesting season, around June and September, respectively. Continuing on Highway 4 for another 31 miles (50 km) towards Dong Van, travelers will reach Yen Minh City, the capital of Yen Minh district. This is another very small town which is seldom more than a lunch or overnight stop for travelers on the loop. It has a handful of hotels and restaurants but not much in the way of sights. Immediately after departing Yen Minh City the highway narrows and is essentially just a lane and a half wide. Two vehicles meeting head on will each slow and move to the shoulder of the road as much as possible. When large trucks or buses meet, which they often do, the drivers slow to a crawl and carefully maneuver around each other. As the road narrows and snakes its way towards Dong Van the scenery becomes more and more spectacular. Located 93 miles (150 km) from Ha Giang City; Dong Van is without a doubt the tourism capital of the province. It is considered to have the best trekking in the region and makes a terrific base for exploring the most northern reaches of Vietnam. Here you will find some English-speaking locals working in hotels and restaurants which provide menus in English, having become accustomed to serving foreign travelers. Two of the area’s most visited sites are the flag tower at Lung Cu, which marks the country’s northernmost point and the Hmong King Palace. The Palace, Dinh Vua Mèo or Nhà Họ Vương in Vietnamese, was the home of Ông Vương Chính Đức, the former leader of the Hmong people in Ha Giang. Also known as the Voung Palace, it was built in the early 1900’s and is an interesting mix of European and Asian architecture. Both of these sites are easily visited on a one-day tour of the northern frontier. Located 15 miles (25 km) north of Dong Van, Lung Cu (Lũng Cú) is often referred to as “Vietnam’s North Pole” and is known to have some of the provinces most stunning scenery. 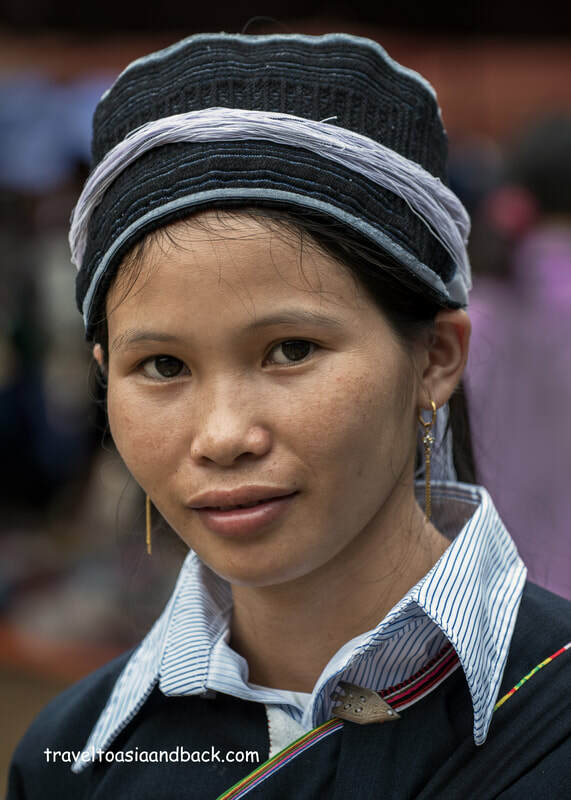 Inhabited primarily by White Hmong people, their lush fields of corn and hemp are surrounded by towering karst hills. Every Friday morning the locals gather in the town center where a small, but lively market is held. Lung Cu is a great place to visit authentic traditional villages and learn about the lives of Vietnam’s minority people. Here visitors can see many fantastic examples of the hand-crafted yellow earthen homes which have been constructed using century old techniques and simple hand tools. One of the most spectacular stretches of Highway 4 is the 12 miles (20 km) that separate Dong Van and the tiny town of Meo Vac. Roughly thirty minutes into the journey both locals and visitors frequently stop at a lookout point which towers 5000 feet (1500 m) above the Nho Quế River. This is the Ma Pi Leng Pass, a narrow road originally carved out of the mountain side by the local minority ethnic people. Meo Vac town is rather small and sleepy and really only comes alive on Saturday nights and Sunday mornings when it hosts two busy markets. 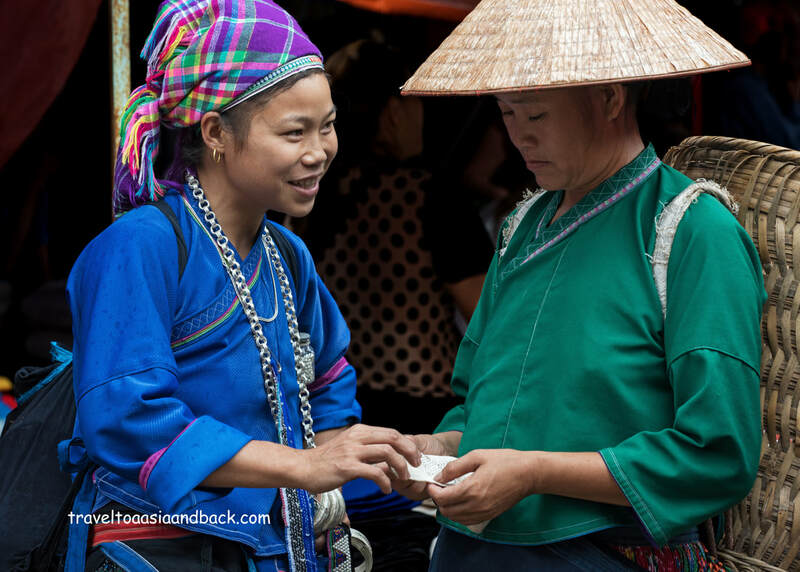 Like all weekly markets held in rural northern Vietnam, ethnic people from the area’s surrounding villages descend on the town to trade goods, eat, drink and socialize. Most of the women and girls will dress in their best outfits complete with white stockings and shoes that are much too fine to be worn in the fields. The men in this region mostly wear traditional simple black outfits which have been used in China for centuries. Just about anything a farmer needs can be purchased here, from seeds to buffalo, tools to goats, clothes, food and household goods. 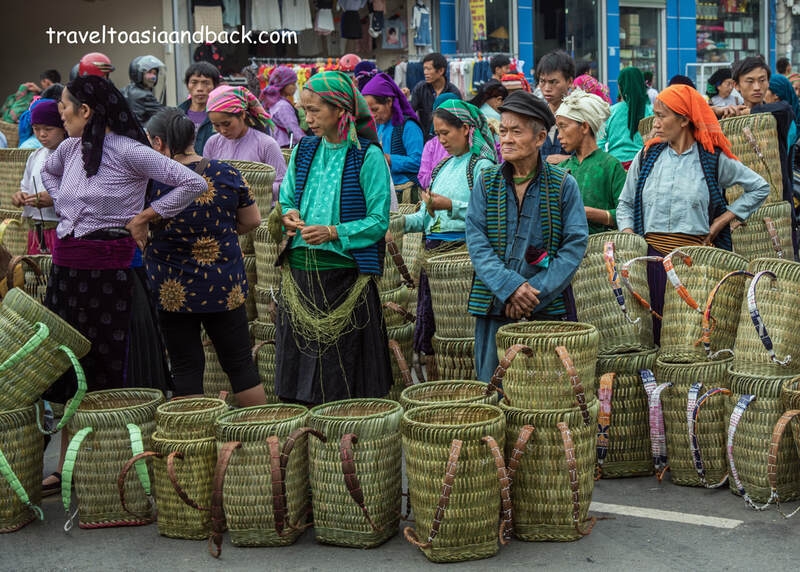 Travelers journeying to Ha Giang province are well advised to put Meo Vac Sunday market on their itinerary. 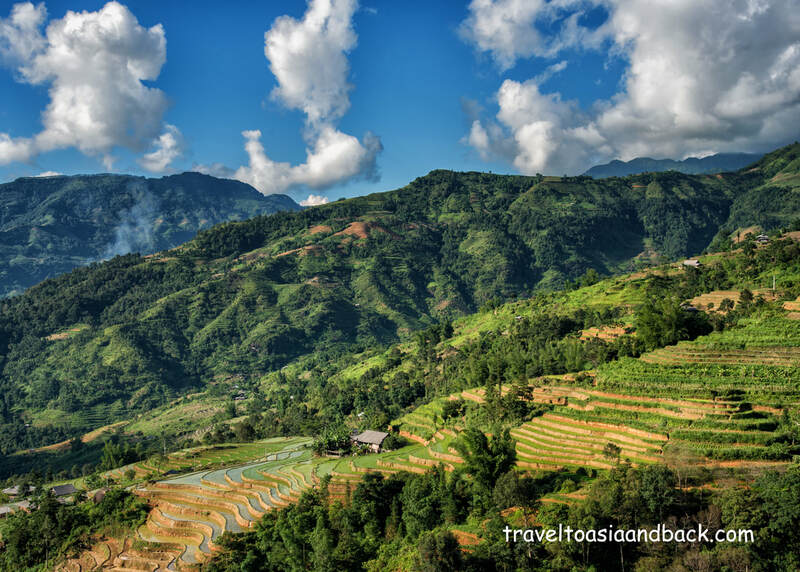 Hoang Su Phi District, one of the most beautiful and remote areas of Ha Giang Province, is well known for its sprawling rice terraces and minority ethnic people. 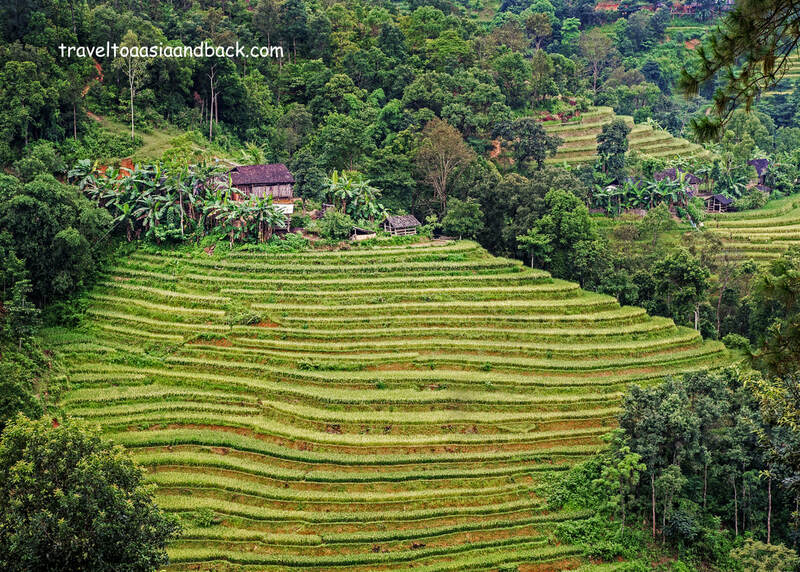 It is fair to say that some of Vietnam’s most photographed terraces can be found here, many of which have been classified as Natural Heritage Sites. 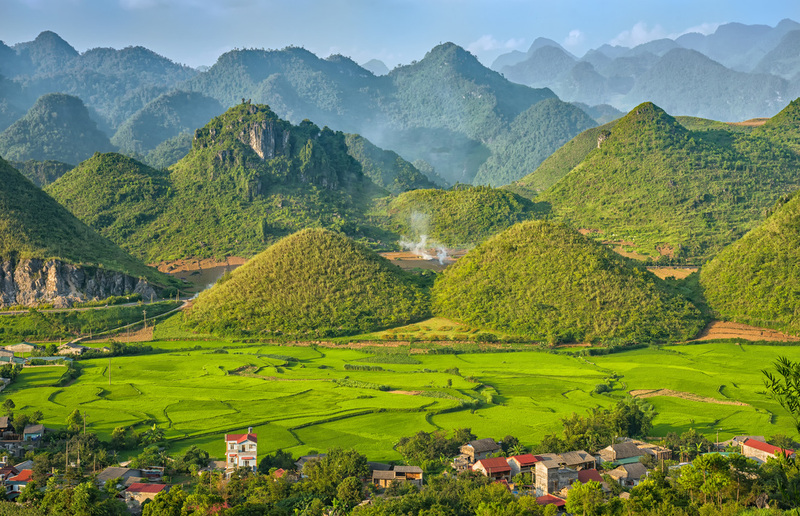 The views are particularly stunning along the stretch of highway 178 that connects Vinh Quang, the district’s capital, with Xin Man District to the west. Besides a handful of home stays, visitors will find that like most parts of the province, Hoang Su Phi has virtually no tourism infrastructure and very few English speaking residents. Although Hoang Su Phi can be reached by bus from Ha Giang City, the area is best explored by motorcycle or hire car. Vinh Quang hosts a lively local market every Sunday. Colorful Dao Ao, Flower Hmong, Nung and Tay people gather here to buy and sell meat, produce, household goods and variety of handcrafted items such as tools and traditional minority clothing. Like most markets in rural northern Vietnam, the trading starts at dawn and concludes at mid-day. Bordering Lao Cai Province, Xin Man is the westernmost district in the province. The district’s capital and the principal town is Coc Pai (Cốc Pài), a small town located on road 178 that connects Hoang Su Phi and Bac Ha in Lao Cai Province. This remote, rural district sees very few tourists and besides from a few small hotels, has little in the way of tourism infrastructure. ​Although Coc Pai can be reached from Bac Ha in roughly two hours via a scenic back road, there is no public transportation on this route. However, Xin Man is well connected to Hoang Su Phi and Ha Giang City by local buses.